CBT Nuggets trainer Garth Schulte recently released his new Microsoft MCSA SQL Server 2016 70-762 course, covering Microsoft SQL Server 2016 and showing you how to design, implement, and optimize SQL databases. In this 33-video course, Garth prepares you for Microsoft’s 70-762 exam, the second of two exams that must be passed to receive your MCSA: SQL 2016 Database Development certification. We asked Garth about his new course and how you can get more out of your training. Q: Why should companies train their IT professionals in developing SQL databases? What value does it bring? A: It will ensure database developers understand proper database design and know how to fully utilize the database objects required for a successful design. Q: Who should know how to develop SQL databases? What kind of career will SQL skills set you up for? A: Database developers and architects for a career in database design. Q: Any out-of-the-box tips for learners to get the most out of your course? Follow along with me in our hands-on labs, and attempt the challenges provided at the end of these Nuggets. They will entice you to think and problem-solve like a database designer! Q: What’s one real-world application someone can expect to use, thanks to Microsoft MCSA SQL Server 2016 70-762? Have you ever wanted to design your own personal database from scratch or work on the team responsible for your organization’s database designs? This course will provide you with the skills necessary to do just that. Q: What course(s) or certification(s) should learners complete before diving into your Microsoft MCSA SQL Server 2016 70-762 course? The MTA: Database Fundamentals course if you’re a complete beginner and the 70-761: Querying Data course to ensure you have basic T-SQL code writing skills. Q: What course(s) or certification(s) should learners look to jump into after they complete Microsoft MCSA SQL Server 2016 70-762? 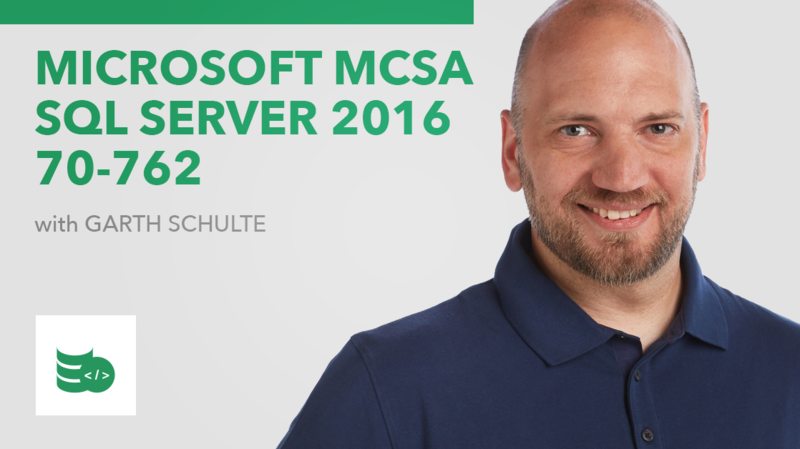 Learn SQL Server with Garth in his new Microsoft MCSA SQL Server 2016 70-762 course today!